The Blue Macaw and many other birds in “Rio”: It tells the story of Blu, a male blue macaw who is taken to Rio de Janeiro to mate with a female blue macaw, Jewel. The Owls in “Legends of the Guardians: The Owls of Ga’Hoole” : When a young owl is abducted by an evil Owl army, he must escape with newfound friends to seek out the legendary Guardians to stop the menace. Alex the Parrot & a Flamingo couple in “Delhi Safari”: the story of a journey undertaken by a cub leopard, his mother, a monkey, a bear and a parrot when the forest they live in is on the verge of destruction. The Hawk in “Rango”: is a minor villain from this 2011 film. Rango encounters the hawk twice early in the film, during both the Hawk chases him and tries to eat him. Orville the Albatross in “The Rescuers”: who gives the rescuers a ride to a destination they wish to reach. Iago the parrot in “Alladin”: Initially with the villan; Iago later joins Alladin’s side. Tweety the yellow canary in “Looney Tunes”: seen often as a plot in which Sylvester the cat makes constant efforts to catch this bird. Crane in “Kung Fu Panda”: Master Crane is the most patient of the Furious Five (others being Master Tigress, Monkey, Viper and Mantis) and one of the most sarcastic. Kevin the Bird from “Up”: Is a giant prehistoric bird. She is friendly to those who are good to her but hostile with those who aren’t. The Blue Birds from “Cinderella”: Seen as happy birds that always help Cindrella. Zazu the Hornbill in “The Lion King”: He is seen to accompany Mufasa, Scar and Simba. Mr. Ping the Goose in “Kung Fu Panda”: He is Po’s adoptive father and enjoys cooking. 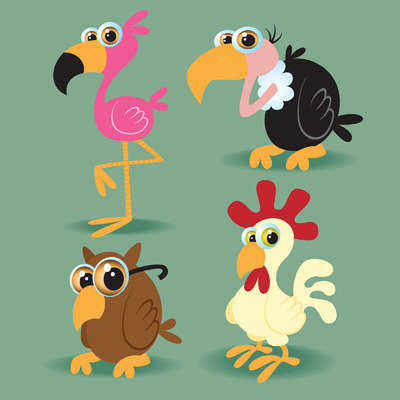 Buzzie, Flaps, Ziggy, and Dizzy are the vultures in “Jungle Book”: shown as friends of Mowgli in the film. The Birds in “The Wild”: Vultures, penguins, geese, and pigeons can all be seen in this movie about animals out of the zoo. The Flamingos in “Alice in Wonderland”: Alice plays croquet with the help of this bird. Scuttle the Sea Gull in “The Little Mermaid”: This knowledgeable bird schools mermaid Ariel on all things human. The penguins in “Madagascar,” “Happy Feet: In Madagascar, the Penguins, a group of four consisting of Skipper, Rico, Kowalski, and Private, spend their days planning an escape that will take them back to Antarctica while in Happy Feet, is the story of an Emperor Penguin who cannot sing but find out he can dance.